In 2017, the Joint Legislative Audit and Review Commission directed staff to study the total compensation provided to Virginia state employees, including cash compensation and benefits. This study was recommended by the General Assembly’s Commission on Employee Retirement Security and Pension Reform. The study resolution directs JLARC staff to compare the value of total compensation in Virginia to other employers, and to research ways to improve recruitment and retention. 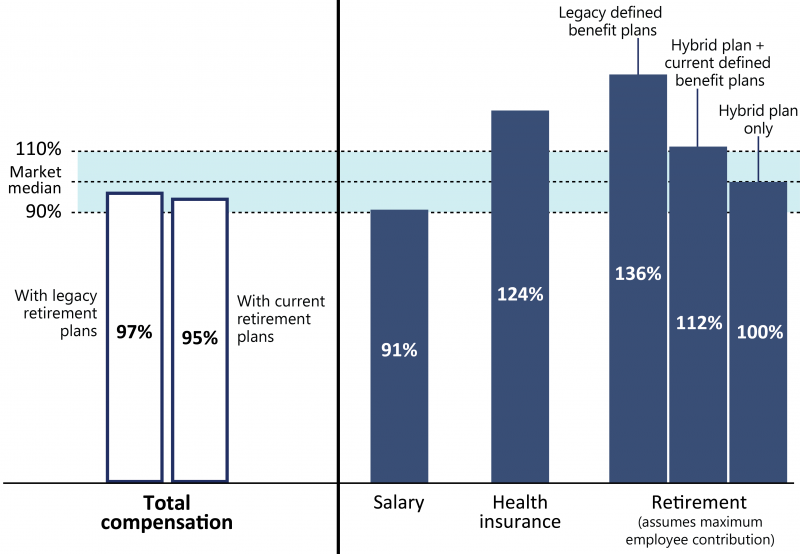 This is the third study of state employee compensation conducted by JLARC staff since 2008. The state compensates its more than 105,000 full-time employees with salaries and benefits, such as health insurance and retirement. The state spent $7.0 billion in FY17 on compensation for its salaried “classified” employees, which are the focus of this study. Salary is the largest portion of state employee compensation, accounting for nearly two thirds of the state’s total compensation expenditures. The combined value of the salaries and benefits for current state employees is, on average, nearly equivalent in value to what is provided by other public and private sector employers in the state. This is primarily due to the state’s relatively generous health insurance benefits, which make up for state salaries that tend to lag the market by about 10 percent on average. Salaries are the most visible and costly component of compensation, and are therefore a significant state investment. Overall, state employee salaries are competitive with what other employers pay. Some jobs, however, have average salaries far below the market for these occupations, including jobs that perform essential government services and functions such as protecting public health and safety and managing public funds. A majority of state agencies indicated that they have difficulty filling open positions, attracting even minimally qualified applicants, and retaining qualified employees. Despite statewide turnover being in line with national trends, a majority of agencies report these challenges for some specific jobs. An inability to pay competitive salaries was identified by agency leaders as the primary reason for recruitment difficulties, and dissatisfaction with salary, along with lack of career advancement opportunities, was the most common reason given by employees who indicated they may leave their current job in the coming year. These challenges can be severe in specific job roles, and employees in some of the jobs with significant challenges also have below-market salaries. Agencies are experiencing the greatest challenges recruiting and retaining employees in health care, health and safety inspection, public safety, and information technology jobs. Several agencies report an inability to perform above the minimum expectations due to these staffing issues, rendering them less able to perform the public health, public safety, or regulatory functions for which they are responsible. Investments in employee salaries are costly, but they are also foundational to state government’s ability to operate effectively and carry out the numerous programs and services that it operates with public funds. Even a one percent salary increase amounts to about $45 million when provided to all classified state employees, underscoring the importance of making cost-effective investments in salaries. The state’s periodic salary increases tend to be uniform across all employees, rather than directed toward occupations for which salary increases are most needed. Moreover, when salary increases are not provided regularly, employees are statistically more likely to leave the state workforce. The lack of prioritization and consistency limits the cost effectiveness of the state’s investments. State employee salaries could be more strategically managed if they were provided at regular intervals and prioritized for jobs that exhibit the most pressing workforce challenges. Individual state agencies could more effectively manage their workforce challenges on their own if state agency leaders had greater authority and flexibility to differentiate salary increases among their employees based on factors such as experience and performance. In most cases, decisions about whether or not employees receive a salary increase, as well as the amount of the increase, are made during the state budget process. The structure of the state budget process, however, does not obligate decision-makers to consider whether additional investments in state employee salaries are warranted, and decision-makers do not have sufficient information to decide whether or how to increase salaries by different percentages across employees. Employee compensation currently competes with every other discretionary item in the state budget and is prone to being set aside for other priorities. Without a means to prioritize employee salaries in the budget process, it is more likely that they will not be consistently funded, potentially creating or exacerbating workforce challenges. Prioritizing employee compensation is the responsibility of the governor, as the Chief Personnel Officer of Commonwealth. The most effective approach for ensuring adequate funding of state employee salaries is for the governor to prioritize them at the beginning of the budget process. The General Assembly could consider requiring that information on the need for and amount of salary increases be provided to the governor before the budget process begins, based on analysis and reporting provided by state agencies and the Department of Human Resource Management. Require the Department of Human Resource Management (DHRM) to convene a workgroup of state agency leaders to develop a methodology for prioritizing salary increases for jobs with the most significant workforce challenges. Require DHRM to report to the governor, through the Secretary of Administration, on priorities for increasing state employee salaries before the start of the budget development process each year. Grant agencies more authority to differentiate among employees in their distribution of centrally appropriated salary increases. DHRM should collect improved data on agencies’ difficulty recruiting job candidates. DHRM should evaluate how agencies can improve career advancement, and therefore employee compensation. DHRM should provide training to all agencies on how to improve career advancement and use their funding to more strategically manage their workforce through compensation and workplace flexibilities.